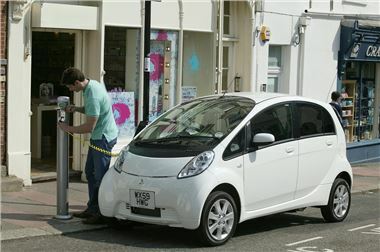 Mitsubishi is slashing the price of its i-MiEV electric car to £28,990 for orders placed for delivery from January 1st 2011. The move comes after much criticism of the original price of £38,699 and also follows Nissan's recent announcement that its impressive Nissan Leaf electric vehicle will cost - you guessed it - £28,990. The i-MiEV has been involved in official government trials since mid-December 2009 with customers in the Coventry and Birmingham area. Some of the key findings of the trial are highly relevant to prospective purchasers of the i-MiEV. More than 2,300 i-MiEVs have been operating on Japanese roads since full production started in July 2009 - making Mitsubishi the first manufacturer to mass-produce an electric vehicle in the world. The i-MiEVs will all be offered with a range of bespoke accessories to help each car fit the "personality" of its owner - from roof and wing mirror graphics to enhanced audio and MP3 options, leather interiors and environmentally friendly accessories. You can read the full Mitsubishi i-MiEV review here.